The good news is that there are Walmart stores on each of the four major islands of Hawaii with six on the island of Oahu; two on Hawaii Island, the Big Island; and one each on Kauai and Maui. Like it or not, we have become a Walmart society. Walmart is the largest retail company in the world. Walmart was founded in 1962 in Rogers, Arkansas by Sam Walton. According to their 2017 corporate factsheet, Wal-Mart Stores, Inc.
has over 11,500 retail units in 28 countries, including over 4,655 retail facilities (Walmart stores and Sam'€™s Club warehouses) employing over 1.5 million associates in the United States. Walmart is without question one of the great U.S. retailing success stories. The Honolulu Walmart is located just off of Kapiolani Boulevard, within 2 miles and 10 minutes of Waikiki where the majority of island visitors stay. For visitors staying in the Ko Olina Resort area, however, the Kapolei Walmart store is the closest, less than 6 miles and 13 minutes away, just south of the HI 93 East (Queen Liliuokalani Highway) heading back towards the airport. Take Kama'aha Ave and Kealanani Ave to Farrington Hwy. The two other Walmart locations listed below are located near populated residential areas in central Oahu which are generally not convenient for island visitors. On Hawaii, the Big Island there are two Walmart locations, one on the eastern side of the island and one on the western side of the island. Both are located very close to each of the two major airports on the island. The Hilo Walmart is located less than 4 miles and 10 minutes south of the town of Hilo just off of Highway 11 (Mamalahoa Highway). The Kailua-Kona Walmart is located about 9 miles and 20 minutes south of Kona International Airport in Kailua-Kona on the Queen Kaahumanu Highway. On Kauai, there is one centrally located Walmart. 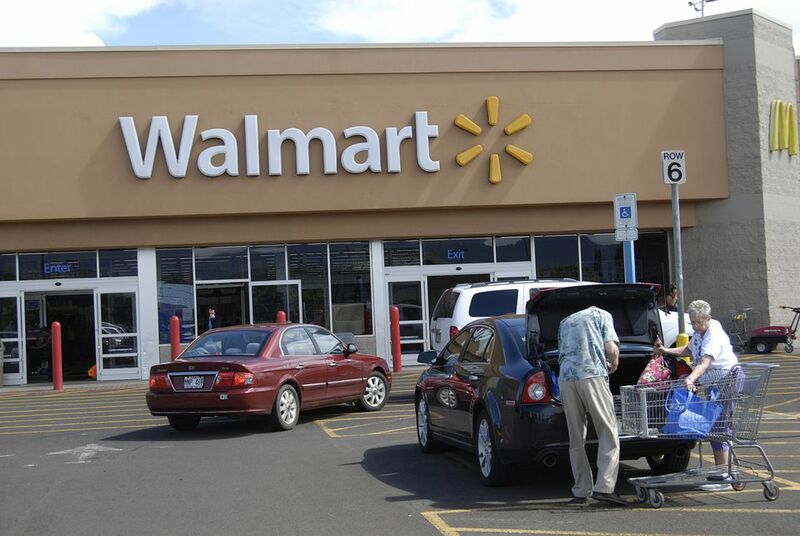 The Lihue Walmart is located on Highway 56, the Kuhio Highway, less than 2 miles and 5 minutes from the Lihue Airport. Whether you're staying on the island's north shore, east coast or sunny southern shore, you're sure to pass through Lihue as your tour the island. Here is the address of the Walmart on the island of Kauai. For visitors to Hawaii who are staying in condominium hotels and resorts or rental properties, shopping at Walmart is one of the best places to save considerable dollars over the amounts charged for grocery staples in the local supermarkets. All of the Hawaii Walmart stores carry a complete line of the basic food items that you will need to stock your kitchen for your vacation in Hawaii. You'll find most of the items you're used to finding at home as well as a lot of local favorites that are worth trying. You'll also be able to find an excellent selection of macadamia nut products, Hawaiian-made cookies, and candy, Hawaiian coffee, wine, and liquor. The Hawaii Walmart stores also are great places to shop for Hawaii souvenirs such as books, calendars, mugs, t-shirts, and hundreds of other items. Each store has a separate Hawaiiana section dedicated to these types of items. Be sure to check their bedding section for such items as Hawaiian themed sheets and quilt bedspreads. So, next time you're in Hawaii, stop by one of the local Walmart stores. You'll be surprised by a lot of what you'll find.